Filed under DIY Flowers, Flower Design. 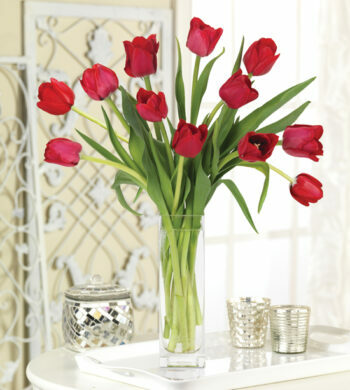 May Day celebrations often include the lovely tradition of gifting baskets of flowers to friends and neighbors. As we put away our bunny decorations and prepare to honor mom for Mother’s Day, there is an often overlooked but beautiful springtime tradition, May Day. May Day is a celebration of nature that first began as a festival to honor the Roman goddess of flowers, Flora, and is observed all over the world. For centuries, May Day was a popular event that was commemorated with festivals, dances, and other joyful events from crowning a May Queen with a floral tiara, to dancing around a May Pole. In Italy, May Day is considered the happiest day of the year. This is fitting this day was chosen to honor the return of sunshine and spring flowers. In addition to dancing around a May Pole, May Day baskets, a formerly popular New England tradition, appear to be making a comeback in the United States. May Day baskets were commonplace in the early 20th century when young children would hang a basket of freshly picked spring flowers and small gifts, like candy or a card, on the doorknobs of neighbors and loved ones. These baskets were tokens of gratitude for friendship and a cheery way to welcome spring. Children would hang a May basket on the door, ring the doorbell and run away so recipients would find a surprise on their doorstep. These flower baskets were also used as romantic gestures, as May Day was a lovingly quaint and sentimental day. 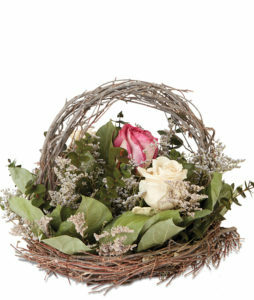 Hang a Spring Rose Swing on a door for a twist on the traditional May Day basket! Nowadays, May Day is a popular day for parades, dancing, and festivals that are geared towards young kids. Many children revel in May Day celebrations by dancing around a May Pole and having wholesome fun outdoors like planting seeds and watering gardens. One way to join in on the fun would be to get the kids or grandkids out and revive the lovely spring tradition of May Day basket surprises! It is a great way to teach kindness and gift giving to little ones while enjoying the outdoors and creating fun floral projects. While many can simply grab a basket and head outside to pick wildflowers, if you are in a cooler climate or in a spot where the flowers just aren’t quite ready, we have plenty of wonderful flower options to choose from. Take any of our spring flowers to fill your baskets or create woven flower crowns to wear to a May Day celebration. 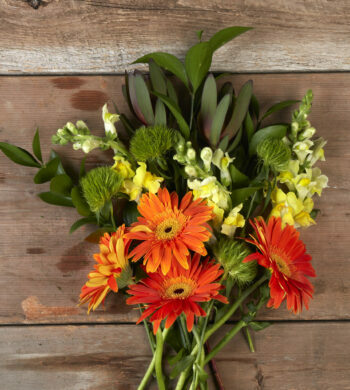 All our bouquets feature bright and fragrant flowers that are sure to delight friends and neighbors alike. Choosing your favorites could also be a fun way to gather flowers to mix and match for the perfect combination to treat your neighbors to. 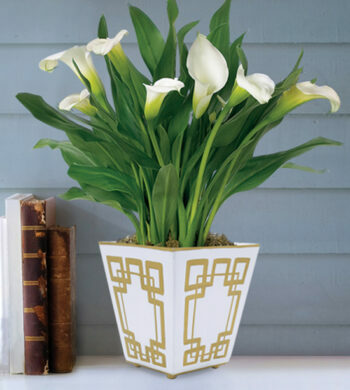 If you are far away from loved ones you want to give a May Day flower basket to, sending a floral gift is a gesture of kindness and quite the surprise for those unfamiliar with these forgotten traditions! 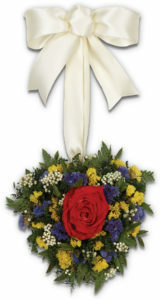 Or leave it to our flower experts who have created a pretty pansy wreath that is welcoming and lively. 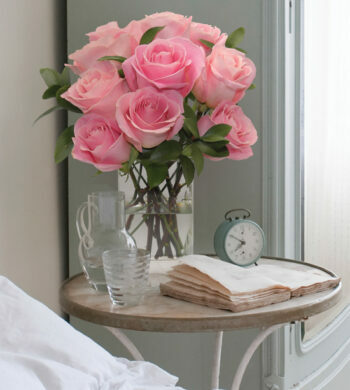 Another fun and fitting option would be a Spring Rose Swing that can be hung on a doorknob for a perfectly sweet surprise in the tradition of May Day baskets. Hang it on your door or send it to a distant friend or loved one as an unexpected surprise. Whatever you choose to do, flowers are always a welcome gift and such a fun way to reintroduce long-forgotten traditions. The possibilities are endless as we renew ourselves with warmer weather and sharing with friends and loved ones. So, choose a basket, find your favorite flowers, and start celebrating!